Jimmy Carter and the UFO….. In 1973 future thirty ninth American President Jimmy Carter filed a report with the national body for investigating ‘unusual aerial phenomena’ claiming that in October of 1969 he saw a UFO in Leary, Georgia. The man, who four years later who become the most powerful leader of the western world told reporters that he would never again pour scorn on those who had claimed to have seen spaceships in the American skies. Indeed he went further in 1976 during his presidential election campaign by declaring his encouragement for allowing the public and scientists to view confidential government reports on unidentified flying objects. Needless to say this was soon retracted by the now President Carter citing ‘defence issues’. What better way of stoking UFO fever than a President saying that?! The ‘sighting’ occurred around 7.30 pm one evening as he waited to take part in a Lions Club meeting. Carter, along with half a dozen others claimed to have seen an object “about the size of the moon, with bright lights and changing colours” He went on to describe how it hovered above the skyline before heading towards Earth and then swooping off in the distance. Carter’s high profile would have meant that such an incident would be followed up and taken more seriously then the plethora of reports that were being filed by Americans on a regular basis in the 60s and 70s. It would, therefore be safe to assume that Carter had got his facts right before speaking out. He did not. All but one of the Lions Club members had no recollection of the event, Carter’s dating of the sighting was nine months out (the club had closed some months before October 1969) and notes from the actual meeting make no mention of it. The one witness who did recall it said that it seemed of little consequence at the time and thought it was a weather balloon of some sort. So what did Carter see? According to meteorological reports the weather on that day showed clearly that what Carter had seen was in fact, the planet Venus. But Carter, a self-declared amateur astronomer reputed the claim and told reporters he knew what Venus looked like and whilst he didn’t think it was a spaceship he didn’t believe it was Venus or a military aircraft. In a later turn of events it transpired that the most likely reason was the formation of high altitude barium clouds caused by the US Air Force testing rockets launched from the Eglin rocket range in Florida. 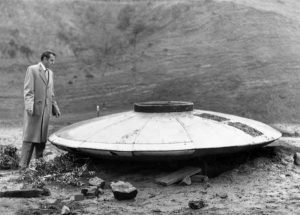 It is difficult to comprehend that Carter would go on public record about something as fantastical as UFO’s, he denied the FBI had refused to show him secret files and that they had information of extra-terrestrial life and tried to change the direction of the story in later years. Why he got the dates so wrong in the first place seems as mysterious as that which he believed he saw shining brightly in the skies. Conspiracy theorists, it’s over to you!